From Ahnenkult, here's an interesting picture illustrating the logic of the Australian humanitarian progressives now reviled as racists for the "Stolen Generations:"
Before the development of antibiotics, full-blooded Australian Aborigines were dying off at a rapid rate from tuberculosis and other Afro-Eurasian diseases. The half-white children of Aboriginal mothers tended to be more resistant to diseases, but they tended to be neglected and abused by their often alcoholic Aboriginal relatives. So, reasoned the social workers, why not raise them in white ways in boarding schools, allowing them to find a place in white society and marry whites? 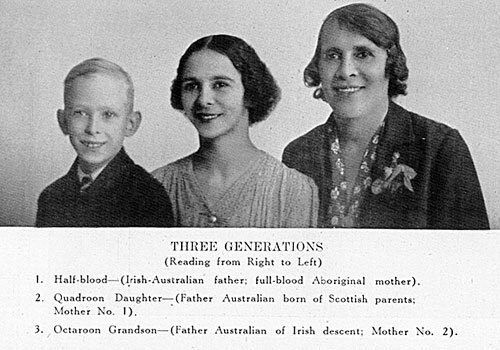 Because Aboriginal looks tend to be relatively recessive when mixed with European looks, as compared to Sub-Saharan African looks, within a couple of generations you get a kid who looks like a cross between Prince Charles and Bing Crosby, so their descendants would be largely indistinguishable from the general population. Problem solved. Of course, as we all know now, those reformers were The Worst People of All Time. And yet, antibiotics aside, sensitive 21st Century Australians are better at feeling superior to their ancestors than at actually solving the problems that their ancestors confronted. For example, when Australian director Philip Noyce made the movie Rabbit-Proof Fence a decade ago condemning Evil Old Social Workers by showing girls who run away from their boarding school to return to their Aboriginal mothers, his adolescent star ran away from the set and had to be rounded up. Then when filming was over, Noyce saw what a disaster her Aboriginal home life was, so he ... paid to put her in a boarding school.